Australia’s bicycle organisations called this week for greater action on education and enforcement for safe passing distance of bicycle riders. Led by We Ride Australia, the media statement, co-signed by nine state, territory and national organisations, referred to the recommendations of the recent Inquiry into the National Road Safety Strategy calling for an investment of $3 billion as one of 12 recommendations to reduce the cost of road trauma, particularly for vulnerable road users. Read our statement here. We Ride Australia was very pleased to present to senior police recently on the successful education and enforcement campaign by West Midlands Police for safe passing distance of bicycle riders. 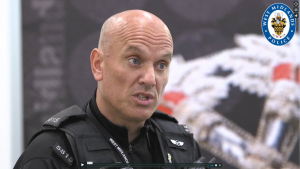 Showing a video from PC Steve Hudson who, with PC Mark Hodson, is responsible for the campaign in the UK he explained how similar campaigns have now been rolled out to more than half of all UK County Police Forces. He generously responded to questions from We Ride Australia and made the video for us that we have now posted online. See it here. We Ride Australia was one of a small number of invited participants in a cycling roundtable on 3 October hosted by Greens MPs in the NSW Parliament. Together with local advocacy groups, Bicycle NSW and the City of Sydney, the forum looked at ideas to improve cycling. They included developing key priorities that all advocates support and starting a ‘NSW Parliament Friends of Cycling’ group similar to federal Parliament’s Riders on the Hill organised by We Ride’s Stephen Hodge for over a decade. Above: Stephen Hodge (second from left) was part of a cycling roundtable held within the NSW Parliament. We Ride Australia has played a key role in building the national representative body for state and territory governments, local governments and walking and cycling advocacy groups – Cycling and Walking Australia and New Zealand. Replacing the previous Australian Bicycle Council, Cycling and Walking Australia and New Zealand commenced operations in early 2018 and is currently engaged in strategic planning for the upcoming federal elections and a future plan of activities. The latest meeting was held in Sydney on 20th September to identify a strategy for greater investment in walking and cycling. See the Communique here. The Council of Capital City Lord Mayors (CCCLM) is the major representative body for Australia’s eight capital cities (Canberra, Darwin, Sydney, Melbourne, Brisbane, Perth, Adelaide and Hobart). 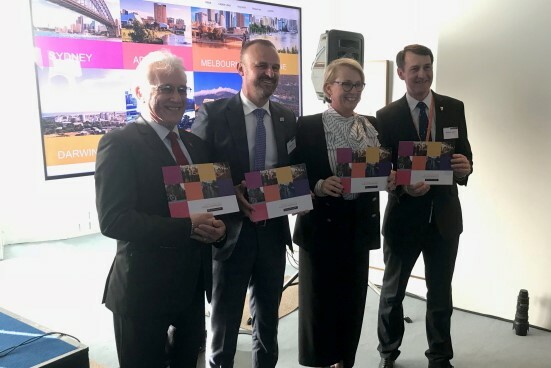 Together with We Ride Australia, CCCLM is a foundation partner of the Parliamentary Friendship Group for Better Cities, an important Parliamentary forum for topics relating to the health, productivity and liveability of cities. Several times a year the Mayors meet in Parliament and conduct meetings and launch events as they did recently for Australian Cities – Places for People. We Ride Australia attends these important functions as an invited guest, giving us an important opportunity for direct contact with some of the most powerful elected officials in Australia. Read the document here. You Can Now Make Monthly Donations to We Ride Australia! Your small, regular contribution will make a huge difference to us at We Ride Australia. Our track record of success in winning federal funding for cycling and related infrastructure means that as a supporter you’re effectively leveraging your money by up to 100 fold! We have a page set up on our website to accept automated monthly donations starting at just a $10 per month. Please visit it now at our donate page and start a regular donation for the amount of your choice. Thank you very much for your support of We Ride Australia! The regions that bank on the economic & community opportunities presented by cycling & cycle tourism are many and varied, from the 750-mile Empire Trail from NYC to Canada LINK to Tamworth spending $17.2m on cycling and sports facilities LINK. Biketober Business Challenge, NSW. ‘Get back on a bike this October and rediscover the joys and benefits of cycling!’ For more info: lovetoride.net/nsw. National Ride2Work Day. Join ‘Australia’s biggest celebration of commuter riding’ this week on Wednesday, October 17th. For more info: Ride2Work Day. CycleLifeHQ Bicycle Tourism Conference & Australian Walking & Cycling Conference is on in Bendigo from Friday, 26th October. Hosted by the City of Greater Bendigo, there is a jam-packed program of five days with of two conferences, presentations, professional workshops, activities, events and networking opportunities. Not to be missed! Conference website. Thanks to all our Foundation Benefactors and Members. Without your valuable contributions We Ride Australia would not be able to make a difference. Everything we do is focused on making riding a bike a positive, healthy and safe reality for people of all ages throughout Australia. We are always pleased to welcome new members. If you’re not yet a member or would like to recommend a new member, please contact our Development Director, Phil Latz at phil(at)weride.org.au.